Varanasi's prominence in Hindu mythology is virtually unrivalled. 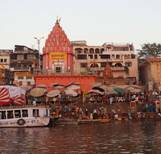 The revered and ancient city Varanasi is the religious centre of the world of Hindus. This is one of the oldest living cities in the world. Many still use the anglicized forms of Banaras or Benares, while pilgrims to it Kashi. The city of Varnasi is situated on the west bank of the holiest of all Indian rivers, the Ganga or Ganges. The relationship between the sacred river is the essence of Varanasi - the and of sacred light. The Gnaga is believed to have flown from heaven to wash away the worldly sins of the human race of mortals. The life and activities in the city revolves around the holy river. Varanasi is located in the north Indian state of Uttar Pradesh and extends latitude 25�20' N and longitude 83�00' E. Sandwiched between the rivers Varuna and Ashi as they join the Ganges. The ancient most cities like Nineveh, Babylon and Thebes are now part of the history only but Varanasi is still exsisting, full of verve and life. It was here in Sarnath that Lord Buddha first enlightened the people with its divine teachings more than 25,000 years back. After this Varanasi became a great Hindu center, but was looted a number of times by Muslim invaders from the 11th century on. Although the foreign invaders looted this city repeatedly and read monuments and shrines to the ground, many old monuments still attract the tourists.Varanasi probably derives its name from the two rivers that flank the city, the Varanasi to the North and the Asi to the South. This day commemorates the Lord Buddha's birth enlightenment and attainment of Nirvana, all on one day. Devotees of Lord Shiva celebrate this on the amavasya.Orthodox devotees remain awake on the preceding night listening to hymns and sacred texts. In Varanasi a marriage procession of Lord Shiva is taken out starting from Mahamritunjaya temple, Daranagar to Kashi Vishwanathan temple via chowk.It is celebrated all over the country, especially in Northern India. Devotees throng the Shiva temples and the temples become venue of fun filled air. This is a music festival which s celebrated for nearly five days and it falls in the month of March. It is performed by renowned artistes at Tulsi Ghat. Shilpgram Mela is held annually in the west of the city of Udaipur. Shilpgram Crafts Fair is organized to promote art and craft of Rajasthan. Since, Rajasthan has always been famous for its handicrafts and artwork; this fair is a perfect destination to try out the hand woven clothes, embroideries, mirror works and handicrafts. Bharat Milap is a significant festival of Kashi and is held in October/November. Bharat Milap is celebrated in honor of Lord Ram's return to Ayodhya after 14 years of exile and his reunion with Bharat his younger brother. The festival signifies the victory of good over evil. The presiding deity of this temple is Lord Rama and it was built in 1964 by a philanthropist family. This is the spot where Goswami Tulsidas composed the epic 'Ramacharitramanas' which provides us with the whole history of Lord Rama. Situated in the cantonment area of Benaras (Varanasi) the St. Mary's Church has a low tower, spire and projecting poitico which have a very notable architecture. 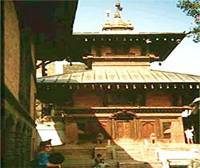 This temple is also referred by the name 'Kathwala temple' and was built by a Nepali king on Lalita ghat.This is the only temple of its style in India of beautiful woodwork which is believed to be not eaten by termites. This is one among the largest and oldest university of North India. This is a great educational campus which is distributed over an area of 2,000 acres and was established by Pt. Madan Mohan Malaviya.The campus also houses a huge Vishwanath temple which was built and maintained by the Birla family. The great river banks at Varanasi built high with 18th and 19th centuries pavillions and palaces, temples and terraces, are lined with an endless chain of stone steps-the ghats-progressing along the whole of waterfront, altering in appearance with the dramatic seasonal fluctuations of the river level. Each of the hundred ghats big and small is marked by a lingam and occupies its own special place in the religious geography of the city. At the clay banked ASi ghat, the southernmost in the sacred city, at the confluence of the Asi and the Ganges pilgrims bathe prior to worshipping at a huge lingam under a peepal tree. Another lingam visited to that of an Asisangameshvara, the Lord of the confluence of the Asi, in a small marble temple just off the ghat.During the Lolarka Mela fair thousands come to propitiate the goods and pray for the son. Named for the legendry king said to have almost lost everything in a fit of self-abnegation, Harishchandra ghat one of the Varanasi’s two cremation or burning ghats, is easily recognizable from the smoke of its funeral pyres. Further north, the busy Kendra ghat is ignored by pilgrims on the Panchatirthi Yatra.Above its steps, a red and white striped temple houses the Kedareshvara lingam. This is distinguished by an enormous tree that shelters small stones shrines to the nagas, water snake deities. About ten kms from Varanasi, is the place where Lord Buddha after enlightenment gave his first sermon or as the Buddhist say set the wheel of dharma or law rolling. Today Sarnath is considered as one of the richest place to have antiques since the Ashoka period to the 12th century. Suggested reading on the Buddhist places in Uttar Pradesh. Dashashwamedha Ghat the second and business of the five tirthas on the Panchatirthi yatra,lies past the plain flat roofed building that house the shrine of Shitala.This is varanasi's most popular and accessible bathing ghat,with rows of pandas sitting on wooden platforms under bamboo umbrellas. Silk weaving in Varanasi is a cottage industry and in many areas of the city, especially the Muslim quarters one can see looms at work all day and is also very famous for handicrafts.The'Benarsi Sarees'here in Varanasi is one of the most liked variety not only in India but also across the world. The other handicrafts items in the shopping list includes Brassware, copperware, ivoryware,glass bangles, wood and clay toys and exquisite gold jewellery.The other shopping interests include Bhadohi carpets and musical instruments. The main shopping area in Varanasi are the Chowk, Vishwanath gali, Gyanvapi, Thatheri Bazar, Lahurabir, godulia, Dashaswamedh and Golghar. Varanasi is also famous for its Mango fruit-'Langda Aam' and delicious sweets. Indian Airlines flies to Babatpur airport which is 22 km. from Varanasi and 30 km. from Sarnath There is a. direct, daily flight connection between Varanasi and New Delhi. It also connects Varanasi to Delhi, Agra,. Khajuraho, Calcutta, Mumbai, Lucknow and Bhuvaneshwar. For travel reservations contact Indian Airlines. Varanasi is connected to many key cities in India. Kolkata, Delhi, Bangalore and Chennai are well linked to the city by Road.